The Coventry louvered cupola draws its style from its simplicity. 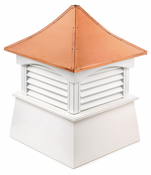 This cupola features a gently angled base that leads into its four louvered sides. With perfect symmetry, it’s as aesthetically pleasing as it is effective at covering vents, pipes or other protruding rooftop objects. It can also be used as a purely decorative ornament on any roof with up to a 10/12 pitch. These Coventry cupolas are cost-effective and durable. They’re available in several sizes, making it easy to find one that works for your needs. At Millworkcity, we care about your project and how it turns out; our customer service team will do anything they can to answer your questions or assist you in placing an order. It's the perfect complement to your gazebo or shed. Our expertly crafted Coventry® louvered cupola features timeless American style. Measures 18” W x 24” H. Builders rule of thumb: 1.5 inches of cupola width for every foot of unbroken roofline. Measures 22” W x 29” H. Builders rule of thumb: 1.5 inches of cupola width for every foot of unbroken roofline. Measures 30” W x 42” H. Builders rule of thumb: 1.5 inches of cupola width for every foot of unbroken roofline. Measures 36” W x 49” H. Builders rule of thumb: 1.5 inches of cupola width for every foot of unbroken roofline. Measures 42” W x 57” H. Builders rule of thumb: 1.5 inches of cupola width for every foot of unbroken roofline. Measures 72” W x 101” H. Builders rule of thumb: 1.5 inches of cupola width for every foot of unbroken roofline.